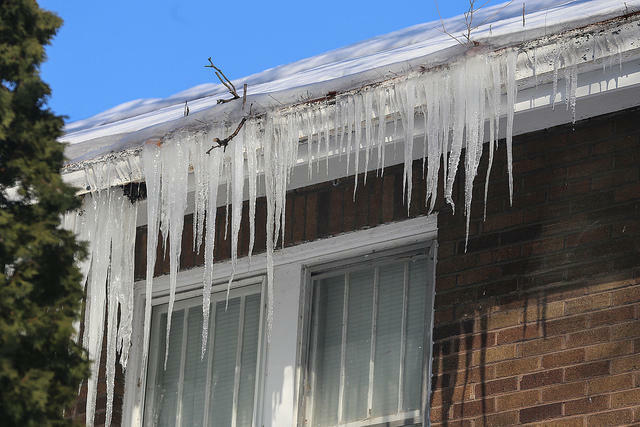 Ice dams on the roof can indicate poor insulation in a home. New Hampshire winters are cold but that doesn't mean you have to be. Granite Staters face unique problems in heating their homes: some of the nation's oldest housing stock, little access to natural gas and extreme weather. New Hampshire ranked 21st on the American Council for an Energy-Efficient Economy’s State Energy Efficiency Scorecard while nearby Massachusetts, Connecticut and Vermont scored in the top ten. But local programs are working to close the gap with discounted energy audits and rebates for energy efficiency home upgrades. Plus, earth-friendly fuel options are getting more affordable. We discuss ways Granite Staters can keep warm and stay on budget. For a list of resources, click here! Listen to our conversation on home heating. Sarah Brock - Energy Program Manager at Vital Communities. Sam Evans-Brown - host of NHPR's Outside/In, a podcast about the natural world and how we use it. Don Kreis - Consumer Advocate for the Public Utilities Commission. Ted Stiles - energy auditor and efficiency program manager at Yankee Thermal Imaging and presenter at “Button Up New Hampshire” for Plymouth Area Renewable Energy Initiative. We've collected a list of resources and programs for all types of residents: check it out here! Your Home Is Cold. Here’s How To Fix That. You’re cold and you want to fix that. But there are a whole lot of options and a pretty big price tag with each of those options. The phrase “energy efficiency” might have you thinking solar panels and electric cars, but the most effective energy efficiency measures are surprisingly low tech. Of course, each home has its own story - and its own expenses - but there are a number of weatherization and rebate programs available to Granite Staters to prepare your home for winter. New Hampshire residents who fall behind on their gas and electric bills have some protection now that winter weather has set in. During cold-weather months, disconnecting gas or electric service can be dangerous. So last week, different rules for doing so kicked in. Residents of Canaan, Enfield, and six New London-area towns will be eligible for discounts on home insulation and weatherproofing projects this year. The program, called Weatherize, is run by the Upper Valley non-profit Vital Communities, one of a number of New Hampshire groups looking to encourage homeowners to seal up drafty, inefficient homes. New England's electric grid operator says the region should have enough fuel to get through the winter, even if the weather gets colder than expected. But utilities and power users say they’re still worried about winter reliability long-term. The grid operator, ISO-New England, says they learned some things from last winter's cold snap. Demand was high and natural gas imports and pipelines were strained, so power plants turned to their coal and oil reserves.